An away match against the League-toppers was always going to be a tough ask, but to undertake it with a depleted squad made it even more difficult. Great credit to the 17 who took the field (including 2 1st xv debutants, Lewis Robinson & James Smith) and shame on those who chose not to travel, thus letting down their teammates and the Club. Injuries during the game and a yellow card did not help matters, but before any such problems ‘Ensians competed fully and indeed looked for all the world to be “on a par” with the opposition. 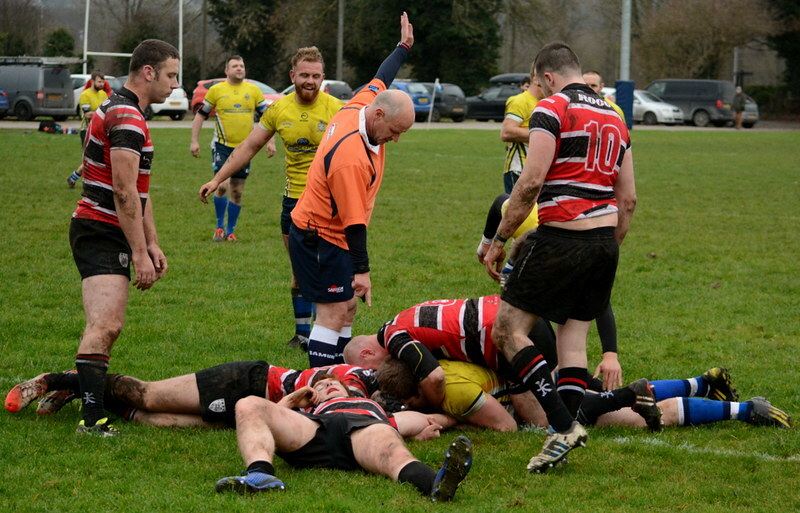 The scrum was good, rucking fierce and effective, tackling secure and Knottingley couldn’t get their line- out right. All seemed promising and then, out of nowhere, the home side scored 4 unanswered tries, all of which were converted, to give them the bonus point and a 28 - 0 lead. From ‘Ensian possession and position Knottingley had made turnovers and with seemingly extra men, and acres of space, ran unopposed to the try line. The home side were full of confidence, ran with pace and tackled hard and ‘Ensians lost cohesion and direction. However, on the stroke of half time the visitors went over wide out through Connor Bateman and Kristian Keinhorst converted with a superb kick. 28-7 at the break. The first session had been extraordinarily long and a not-very-bright day was turning into an extremely dull one in more ways than one! Pinned in their own half from the restart, ‘Ensians struggled to make any headway and with both subs on to cover injuries, enforced positional changes and an opposition enjoying territorial advantage, it was not long before the dam cracked. It was soon 35 points and then 42 and a strange curate’s egg performance from the Old Boys, who had parity for periods and then seemed to give up the ball and watch the score mount up 7 points at a time! It was all too easy for a rampant Knottingley. With 10 minutes to go, the hosts scored and converted and followed almost immediately with a runaway try, this time unconverted. The scoreboard looked distinctly lopsided at 54-7! To their great credit, the visitors kept going, exerted some real pressure and forced an infringement. A kick to the corner, a good line out and Lee O’Donnell went over. The kick failed and whilst Knottingley might have been forgiven for conceding a try at that stage, they were annoyed and it again infuriatingly showed that had ‘Ensians been able to compete more consistently, the imbalance of 8 tries to 2 might have been redressed. A red card at the end was probably borne out of frustration and was disappointing and unnecessary, but the day had been a hard one and there could have been despondency. Happily not so; the post-match mood was upbeat, with players having given of their best shoulder to shoulder and being openly honest about their performances. Serious injuries sustained by Ieuan Cranswick, Rob Lofthouse and Jack Smith will do nothing to help next week’s availability, but 17 players today did indeed turn up and represent their Club with credit. A heavy defeat, but no disgrace, far from it!